[New York, 22 March]—After two weeks of intense dialogue, the 63rd session of the UN Commission on the Status of Women (CSW63) concluded today in New York with a strong commitment by UN Member States to safeguard and improve women’s and girls’ access to social protection systems, public services and sustainable infrastructure, ensuring that their design and delivery is transformed to prevent discrimination and create a ‘level playing field’ for women and girls. The outcome of the two-week meeting, known as the Agreed Conclusions, adopted by Member States, puts forth concrete measures to bolster the voice, agency and leadership of women and girls as beneficiaries and users of social protection systems, public services and sustainable infrastructure. Strongly condemn the impunity and lack of accountability rooted in historical and structural inequality that accompanies pervasive violence against women. Universal access to an old-age pension, quality health-care services and safe and affordable public transport can enhance women’s income security and independence, shape whether a small entrepreneur will get her products to market on time, and at what cost; or whether an adolescent girl can get safely to her school and has access to a toilet. This can determine whether girls go to school at all, what markets a woman farmer can access, and how much time she has left in a day to pursue other paid work or leisure. 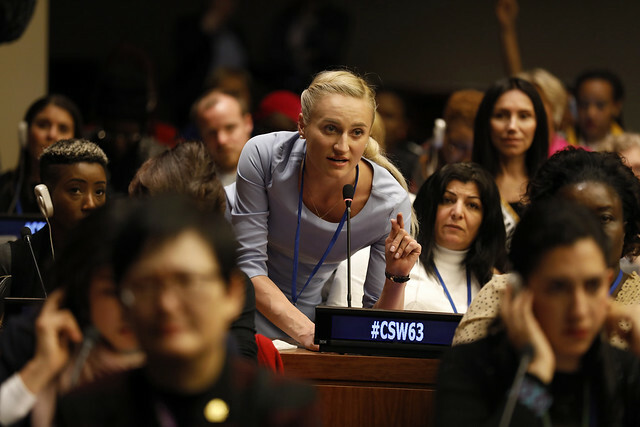 As the single largest forum on gender equality and women’s rights for UN Member States, civil society organizations and other international actors, this year’s CSW saw a record number of attendances. Participants included more than 5,000 representatives from civil society organizations around the world, nearly 2,000 Member State delegates and 86 ministers. Social protection systems, public services and sustainable infrastructure are integral to achieving the implementation of the landmark 1995 Beijing Declaration and Platform for Action and the 2030 Agenda for Sustainable Development adopted by world leaders.